Blacksmith Paradise Anvil Gallery : Images of anvils of the world. Emerald Koch Collection of Anvils, Vises and Tools. Emerald Koch is a world renowned dealer in used blacksmithing tools of the highest quality found in Europe. He is located in Fehring, Austria and will ship orders internationally. Check out the beautiful tools for sale on his web site, BlacksmithParadise.com. More to come . . .
525kg Söding & Halbach No.7 Amboß (anvil) on stand. One of the world's largest and finest anvils. Unusual anvil made with large round boss at Hardy Hole. A beautiful piece of 16th century craftsmanship. Antique example of fine French craftsmanship. Anvil with side hardy hole and hardy to fit. 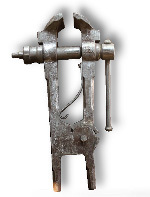 From our Vise Gallery and the collection of Emerald Koch, BlacksmithParadise.com. You don't see vises in the U.S. with the strength features this vise has. From our Vise Gallery and the collection of Emerald Koch, BlacksmithParadise.com. Includes parts diagram and cutaway view, links to other Wilton Vises.